This Google Maps mashup from the Scottish Road Works Commissioner has been designed to allow the public easy access to real time information about ongoing road works anywhere in Scotland. Users are able to find out how long the works are expected to last, which organisation is carrying out the works and contact details for that organisation. 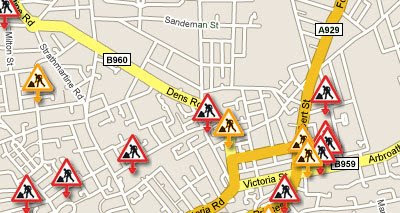 Road works are shown on the map by coloured markers to indicate the degree of impact the road works are expected to have on traffic. 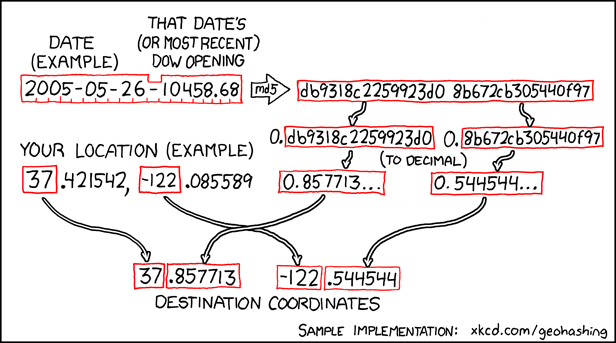 It is possible to search the map by area and date. Which means users are able to check planned roadworks for future journeys. This is a great example of how governments can share public data in an informative and useful way. More please! Have a look at the two satellite images below of the Place de Terreaux in Lyon, France. The bottom one has the 'show labels' option turned on. The French sure do have imaginatively shaped roads. Thanks to Emmanuel & Antoine for submitting this! I'm not buying any sandwiches here. Geohashing is a method for finding a random location nearby and visiting it. 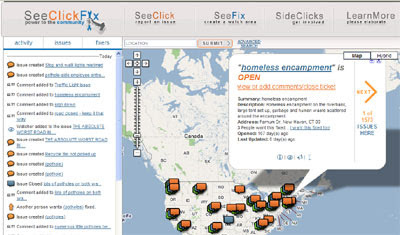 SeeClickFix is a website that allows anyone to report a local problem. For example Boston.com recently embedded a SeeClickFix map on its website to allow its readers to report potholes in the Boston area. 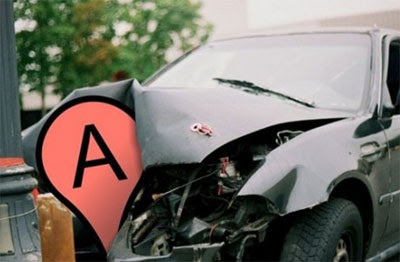 However, SeeClickFix is not restricted to problems with roads and users can use the map to report any kind of non-emergency issue in their neighborhood. Clicking on the map opens a ticket where the issue can be described. The idea being to publicly report an issue so the resolution can be crowdsourced. The site resembles FixMyStreet.com, which operates a similar service in the UK. However whereas FixMyStreet reports all problems to the relevant local authority SeeClickFix doesn't restrict the fixing to local government. Anyone or any organisation can draw a watch area via a Google Map and then get alerted when something is reported in the area. 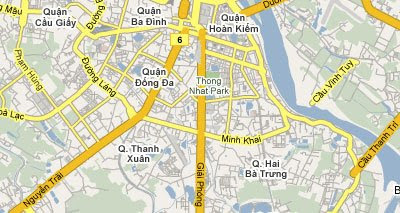 Non-Thai speaking users can still view the map of Thailand in English at http://maps.google.com/. However, the Thai language version of Google Maps means that Thai speakers now have access to all the Google Maps goodies in Thai. This includes Thai My Maps and Mapplets. If you missed the Google Maps Thailand Opening Event you can check out Macroart's photographs of the event on Flickr. Google have today added an exciting new feature to Google Maps that lets users explore popular user-contributed photos from Panoramio at major landmarks around the world. Eiffel Tower, Notre Dame Cathedral, Times Square, Sydney Harbour Bridge, the Golden Gate Bridge and the Colosseum, Rome. Most online real estate companies now use some kind of digital mapping to show the location of properties. Many companies now even use Google Maps Street View, where available, to give another perspective on homes for sale. I think however that UK real estate company Foxtons are the first to use the Google Earth browser plug-in to try and sell houses. And it works very well. 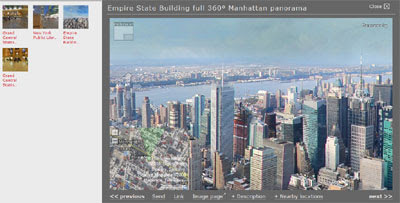 Using the Google Earth browser plug-in means that the company's customers are able to view potential properties against a backdrop of Google Earth's 3D buildings. What would be really cool is if Foxtons went a little further and actually produced 3D models of the properties for sale. That might seem a little time consuming (and expensive) but some of the properties here are over a £1 million so the commission generated could well be worth the effort. TechCrunch are (tongue-in-cheek) calling this site 'the future of mashups', which should ensure that the site is inundated with visitors. The site is a Google Maps mashup of pizza restaurants that uses crowdsourcing to locate the best pizzas. The most important thing for a site that wants to crowdsource reviews is - a crowd. The TechCrunch coverage should help get that started. Searching for restaurants on the map is very easy. Just type in a location or zip code and press enter. Pizza restaurants are then shown on the map. The bigger the map marker the more recommendations the pizzas have had. Using the marker size to represent popularity is a very cool feature and works very well. apparently some other cool features are in also in the pipeline, like tagging and microblogs for each pizzeria. Fairly soon after the crash of the Turkish Airlines Flight on landing at Amsterdam's Schiphol international airport this My Map of the crash was one of the biggest retweets on Twitter. I wasn't going to link to the map because I didn't think it added much to the news of the crash. 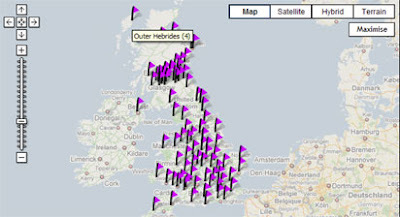 However the map has now been picked up by a number of websites. If you are interested at looking at the statistics about a My Map just click on the comments link on the main Google Maps page (enlarged map). The statistics about the Schiphol map are available here. Bill Chadwick, of Where is the Path? fame, has produced an excellent website of libraries and services for those who are keen on creating outdoor pursuits mashups. 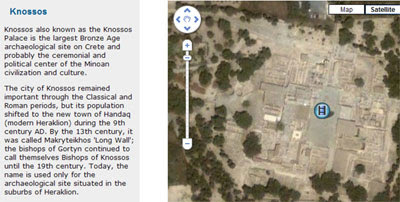 The site includes a number of working examples of the libraries and services mashed-up with Google Maps. Another great example on Bill's site is a Google Map mashed-up with a Java Script Douglas-Peuker algorithm. The algorithm reduces the points in a GPX trail so that the mapped polylines load much more quickly. Anyone who wants to create a map mashup that plots GPX trails should definitely check this out. The new design of map controls that was introduced in Google Maps last month is now available to map developers. // Give it the maps.google.com experience. Maps that contain this line of code will also be automatically updated if the UI of Google Maps is updated. A full reference of the functions, the GMapUIOptions class and all the defaults are available on the Google Maps API Reference. Google have today announced that 16 countries have received map updates care of Google Map Maker. Bhutan, Bolivia, Cambodia, Dominica, Dominican Republic, Guam, Iceland, Mauritius, Paraguay, Philippines, Senegal, Seychelles, Sri Lanka, Tajikistan, Vietnam, Zimbabwe. Google have also put together a gallery highlighting some of the wonderful cartography completed by users of Google Map Maker. The Voice of the Street have produced this cutting edge website that allows street artists to receive feedback from members of the public. Artists leave a QR code on their work, members of the public then take a picture of the QR code with their mobile phone and leave a voice message for the artist. I think there could be a huge call for this. I mean who hasn't seen some graffiti and wanted to leave a message for the 'artist'? I just wonder whether most of the comments are going to be what the artists want to hear. The Voice of the Street from Leif on Vimeo. Update: I've bumped this post back to the front page because Barnabu has now also produced a Debris Map of the collision. Barnabu is quickly becoming my favourite destination for interesting Google Earth files. Two weeks ago Barnabu created a Twitter Snow animation in the Google Earth browser now he has created an amazing animation of the crash between the Russian Cosmos 2251 and the US iridium 33. Satellite Crash from Keir Clarke on Vimeo. Barnabu has now also created a Google Earth Browser map of the debris from the crash. The Debris Map is if anything more amazing than the crash map. This map propogates the orbits of all 134 fragments from the two satellites smoothly in real time. Carnival is the festival season that occurs before Lent, and which ends today with Mardi Gras (Fat Tuesday). 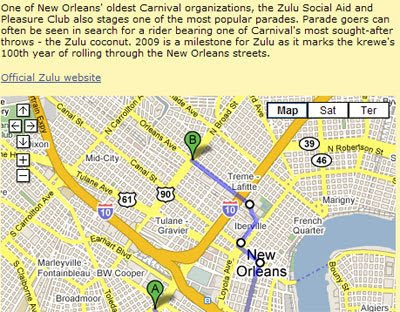 Zulu - Uptown, 8 a.m.
Rex - Uptown, 10 a.m.
Argus - Metairie, 10 a.m.
Grela- West Bank, 11 a.m.
Each of the above links takes you to details about the parade and a Google Map of the route. WKRG News has produced a Google Map showing the routes of Mobile's Mardi Gras parades. Use the tabs at the top of the map to toggle through the four routes. Did you know that there are 192 endangered or dead languages in the United States? That figure includes Coushatta, which is spoken by 350 members of the Coushatta Tribe of Louisiana. It also includes Paviotso, which is spoken by 400 people in Oregon, Nevada, California and Idaho. This UNESCO Google Map mashup highlights the endangered languages listed in the 2009 edition of UNESCO’s Atlas. 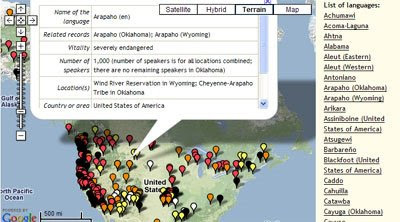 It is possible to browse for the world's endangered languages on the map via a search box or by zooming into individual countries on the map. Update: Where I'm At have produced a much better (and nicer looking) store locator for IHOP restaurants. Their map includes a search option or the option to click on a map and load the nearest restaurants. Where I'm At also have store locator maps for Apple, Best Buy and AT&T stores. Tuesday 24th February is IHOP Free Pancake Day 2009. IHOP wants to help you celebrate Pancake Tuesday, Fat Tuesday or Shrove Tuesday by giving you one free short stack (three) butterscotch pancake. In return IHOP hope its customers will consider donating to The Children's Miracle Network. To help you find your nearest IHOP store I thought a Google Map of all the IHOP locations would be handy. I created the map using Google Spreadsheets, Batchgeocode and Map Channels. One reason I went with Map Channels to create the map is that version 3 of Map Channels (released today) has a great marker clusterer. With over 1400 participating stores I definitely needed some kind of clusterer for this map. Well, there you go. I didn't know that today is also Happy Paczki Day (OK, I didn't even know what a Paczki is). 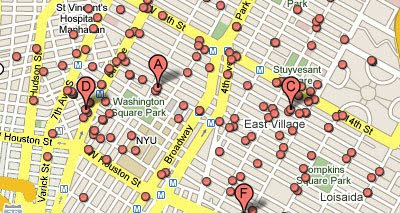 Thankfully Mibazaar has created this map of Donut and Bagel restaurants. If I lived near any of these restaurants I would definitely be heading out to try one. No sooner had I posted about 360Cities latest update than Map Channels got in touch to say they have just released Map Channels Version 3. Map Channels is a website tool that lets you create and embed a custom map into your website or blog without the need for coding. 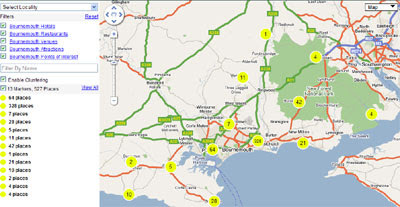 You can see the new clustering feature in operation on this See Bournemouth map. The interactive panoramas website 360Cities has released a new Google Maps interface for interacting with the site's thousands of images. The new interface uses clustering to reduce the time it takes for the map markers to load. At lower zoom levels numbered markers indicate how many images are available at a location. When you zoom in or click on the numbered markers the individual panorama markers are revealed. When you click on a marker the interactive panorama replaces the map so that you are able to enjoy the panorama in all its glory. A small map is shown in the bottom left hand corner of the page. As you pan around in the panorama the map shows you the direction of your current view. This is a a great update from 360Cities. It is now very similar to Google Street View but with much better photography. TweetMapper allows anyone to create a map of their tweets. The map uses OpenStreetMap for the map tiles and the Google Maps API for geocoding (working out the map co-ordinates from place names mentioned in the tweets). To map your tweets you just need to add the #at tag to your messages. 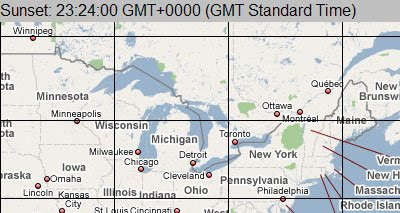 A really cool feature of TweetMapper is that you can define locations. So, for example, you can set the location of your work place in TweetMapper and then use the tag #at work in Twitter to map your location. 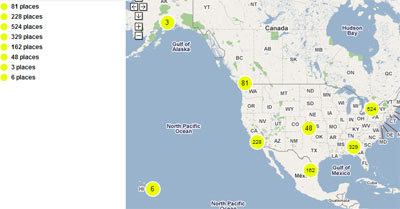 Users of TweetMapper can embed their personal Twitter map in their websites or blog. 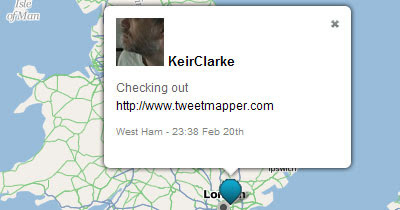 TweetMapper can also give you a kml of your Tweets so you can view your messages in Google Earth as well. This new iPhone application from Schmap puts the 'where' into your tweets. 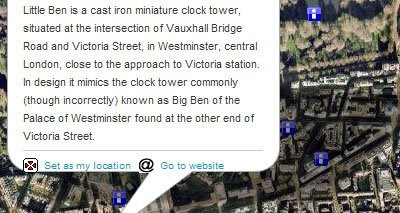 Using the app your Twitter messages automatically include a 'schmap.me' link, showing followers your exact location with a configurable map icon. Previously saved places can also be retweeted, which could be useful for recommending favourite restaurants etc. and inviting followers to tweetups. The link is added to the end of your message. When your followers click on the link they are taken to a webpage containing a map of your location and your message. Google Maps Street View allows anyone to explore any hood anywhere. Rap music seems the most geographically aware of music forms. So what better idea than to map rap songs so listeners can virtually explore the locations being rapped about on Google Maps? Rapmaps does it exactly that. It is a mashup of Google Maps and YouTube rap videos. The videos are geo-tagged by their location. 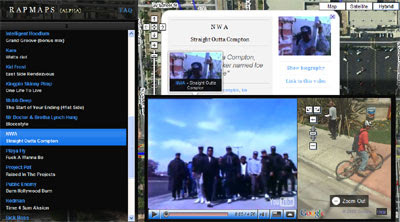 So when Kam sings Watts Riot you can now explore Watts on the map in Street View at the same time as watching the video. Music Torture Map - a map of music misused by torturers. Simon Ilyushchenko, a Site Reliability Engineer at Google, has used his 20% time to produce this Google Earth Browser mashup of CO2 emissions in the US. The map shows data from Project Vulcan, put together by a team of scientists at Purdue University. The data shows detailed emissions for all 50 US states in 2002. Using the map it is possible to see which US states and counties have the highest and the lowest emission rates - absolute or per capita. You can see where people burn more gasoline for driving, or where they use more fuel for heating and cooling their homes and businesses. British tabloid The Sun claim that Atlantis has been found on Google Maps. 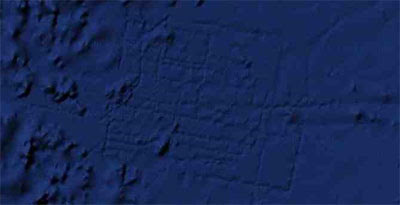 From the screenshot above you can see what does actually look like a city grid in the ocean off the Canary Islands. The grid was spotted by aeronautical engineer Bernie Bamford as he browsed through Google Ocean. Stefan at Ogle Earth has kind of spoilt the fun however by explaining that it is "merely a grid of higher resolution sounding data amid a lower-resolution dataset, taken from a ship surveying the area. " Stefan says that "one phone-call to a serious marine scientist would have sufficed to pour cold water on this story. " Which is probably why the phone call was never made. Whilst Stefan's explanation may have been a little more boring than the Atlantis theory it has been confirmed. A Google spokeswoman confirmed this afternoon that the lines were the result of the sonar as boats mapped the ocean floor. "It's true that many amazing discoveries have been made in Google Earth including a pristine forest in Mozambique that is home to previously unknown species and the remains of an Ancient Roman villa. "In this case, however, what users are seeing is an artefact of the data collection process. Bathymetric (or sea floor terrain) data is often collected from boats using sonar to take measurements of the sea floor. "The lines reflect the path of the boat as it gathers the data. The fact that there are blank spots between each of these lines is a sign of how little we really know about the world's oceans." You have to watch this video even if you have no interest in creating a My Map! I've always had a fondness for pixel art. Over the years there have been a number of pixel art cities on the internet that have grown as users build and add their own blocks. I think this is the first pixel art city to use Google Maps as an interface to view the art work. Google Maps has a great option to view driving directions in Street View. Indian online mapping site Vidteq have gone one better - they provide video with their driving directions. After you have entered your start and end destination Vidteq provides the driving directions and also provides a video of the route. As the video plays the position is continually updated on the map and in the written driving directions. On the video local points of interest are indicated as are all the side roads as they are passed. Vidteq from Keir Clarke on Vimeo. Google sightseeing has provided more visual proof of the little green men amongst us. You can see more Street View alien sightings on this UFO post. This has to be one of the most amazing things I've seen on the interwebs! Jeral Poskey has created a Google Earth tour that re-enacts Flight 1549's crash into the Hudson River. The re-enactment includes sound from eight audio tapes released by the FAA between pilots and controllers. To view the tour properly you need to have installed the latest version of Google Earth (Google Earth 5.0). Jeral explains how he created the tour on his website da Vinci Global Services. The video of the re-enactment below was created by videoing my monitor, so is quite poor quality. Google have announced that the Chrome browser now supports the Google Earth Browser plug-in. Chrome users who have been dying to play with Google Earth in the browser should check out these Google Map Mania posts. Google have also now officially announced that the tiles from Map Maker are available as new map types in both the Google Maps API (v2.146) and the Static Maps API as new map types. 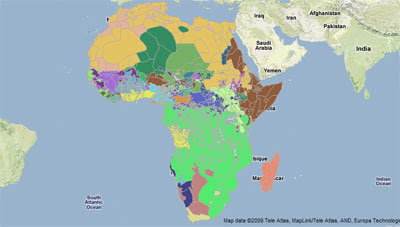 Google Map Maker allows anyone to add map detail in areas of the world where Google Maps at the moment has little data. 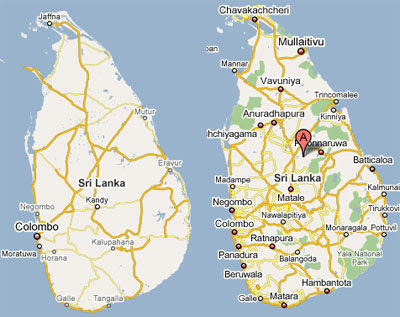 Check out the two maps of Sri Lanka below. The map on the right is from Map Maker and the map on the left is from Google Maps. This Google page explains how you can add Map Maker tiles to your maps. Mapperz has created an example Map of Iceland. Just toggle between the two 'map' buttons to compare Iceland with Map Maker data turned on and off. 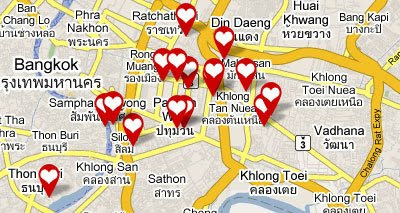 Traffy is a very good Google Map of traffic conditions in Bangkok. Roads on the map are coloured green, yellow or red depending on the current traffic conditions. Traffy can also provide driving directions. If users define a start point and destination Traffy will provide the best current route, avoiding where possible traffic jams. Traffy also includes map markers of traffic cams. When you click on a camera map marker an image of the current road conditions is shown in the map sidebar. The EDT in EDTGuide stands for 'eat', 'drink' and 'travel' and this Google Maps mashup shows the best places to eat, drink and travel in Bangkok. The site is a social sharing site so all the reviews of the bars, restaurants and other points of interest are provided by the site's members. Both of these Google Maps come from the excellent Google Maps Fan in Thailand, which as well as providing reviews of Thai Google Maps mashups, includes tutorials in Thai on how to build your own Google Maps mashups. Yesterday we had a Google Map mashup trying to track the mysterious disappearing Buddhist dentists of Diamantina. Today we have a map tracking UFO's. The Shropshire Star has produced this Google Map to track sightings of UFO's in Shropshire, England. Plotting the sightings in this way on a Google Map allows us to see that the UFO's are clearly using the mouth of the River Dee as a navigational aide in their targeting of the UK's industrial heartland in Birmingham. Either that or these sightings are all from the same person. 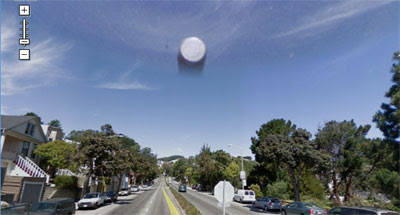 UFO's Caught by Street View - updated with a new Street View image today. Yesterday Google quietly added Calgary and Edmonton, Canada and Belo Horizonte, Brazil to Google Transit. In Calgary Google is working with Calgary Transit to provide bus and CTrain information. In Edmonton Google is working with the Edmonton Transit System to provide bus and train information. In Belo Horizonte Google is working with Empresa de Transportes e Transito de Belo Horizonte S/A. Google have now released information about this latest update. Calgary, Hamilton, Edmonton, and York Region in Canada; East Midlands (UK); Houston (TX); and 21 agencies in the state of Virginia have all been given full schedules for Transit. China has also received a huge increase in transit data, connecting all provinces with 3100 train lines, covering about 2700 stations and all major cities (for example, try Beijing to Shanghai). Adelaide, Atlanta, Bonn, Davis, California, Pilsen, Sacramento, Torino and Hamilton, Canada have had transit layers added. The transit layers in Cape Town, Johannesburg and Pretoria have all also received recent updates. Mapyro is a travel video sharing site that lets you archive your vacation videos and show them on a Google Map. Using Mapyro you can upload and share videos, explore other user's videos via Google Maps, blog about your videos and show your videos to your friends and family. You can also use Mapyro to organize your travel videos in the form of a trip and view your videos in the form of an entire ‘album’. What’s more, you can even write a ‘travelogue’ that describes your trip and videos in greater detail. Virtual Tourism - my own video mapping site, showing hundreds of videos from around the world. YouTube Vision - YouTube Vision, shows the most recent geo-tagged videos from YouTube embedded on a Google Map. Until today local searches on Google Maps only plotted the first page of business results, now Google Maps plots hundreds more of the results as small circles. The top ten results still appear in the left-hand side panel and as markers on the map. However you can now also click on the other circles if you wish to search outside the top ten. The screenshot below shows just a small percentage of the results of a search for 'pizza' in New York. As you can see there are more than ten pizza results for this area. 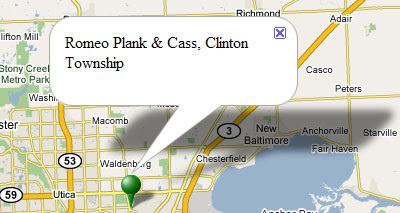 Now even though my nearest pizza restaurant isn't in the top ten results I can find it very quickly on the map. Gastro is a Google Maps mashup of the New South Wales (Australia) Food Authority's name-and-shame lists. It collates the Register of Offences and the Register of Penalty Notices and displays the location of offending restaurants on a map. The map includes an interesting slidebar, which is used to load map markers onto the map. Using the slidebar it is possible to change the number of months of penalty offences loaded onto the map. Gastro from Keir Clarke on Vimeo. If you are interested in watching stock markets falling throughout the world then this is the map for you. This Google Maps mashup presents quotes of stock markets from all over the world. The quotes are updated every 10 minutes and the map gives a comprehensive overview of current global stock markets. The markers on the map show the percentage rise and fall of the market for the day. Clicking on a marker opens an information window with the stock market points total, the total fall or rise and the percentage fall and rise. One of the direct consequences of all the minus signs on the Major World Indices map is rising job losses. 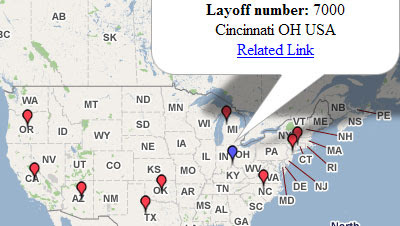 Lay-off Maps is a mashup of self-reported job cuts in the US and around the world. Selected lay-off news is mapped on this website, however, the focus is on individual lay-offs, rather than the large mass lay-off numbers reported in the news. The site also collects information on the profile of laid off employees, such as age, years worked, salary etc. Lay-off Maps say that when a significant amount of people report job cuts they will then provide statistical analysis on the website. USAToday Foreclosures Map - The public records of foreclosures shown on Google Maps highlighting the impact the foreclosures are having on the Green Valley Ranch neighbourhood in Denver. Layoff Tracker 2009 - Mibazaar created this Layoff Tracker to show the effect of the downturn on US jobs. Mapified World Stock Indices - A Google Map showing world stock indices. The bar width shows the market capitalization. 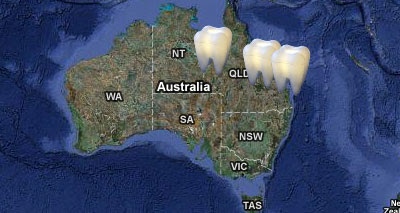 Australian newspaper the Courier Mail has produced this dent-o-tracker Google Map to try and find the whereabouts of the four mysterious dentist Buddhist monks of Diamantina. Apparently the four Buddhist monks set up a dental practice in this far southwestern Queensland town, pulled a few teeth, and then promptly disappeared. When the locals contacted the Queensland Health department to try and find out more about the mysterious molar mending monks the officials said they knew nothing about them. So where did these dentist monks come from and where have they gone? If you have seen the monks you can use this Google Map to help the Courier Mail in its hunt. Just fill in a short form and your sighting will be added to the map. Unfortunately, so far, the map seems to consist only of people reporting that they haven't seen the monks. Travel website Cheaperthanhotels have today unveiled a new Google Maps interface that allows travellers to compare hotel prices and locations at the same time. Apart from a few teething problems (some very weird things happen when you view the site in FireFox and Yosemite National Park has been mapped just off the coast of Nigeria) this is a good implementation of using Google Maps to search for hotels. By combining their own dynamic pricing technology and the Google Maps API, Cheaperthanhotels enables travellers to search for accommodation using a variety of criteria and then display the appropriate hotels on a Google Map alongside the average prices. 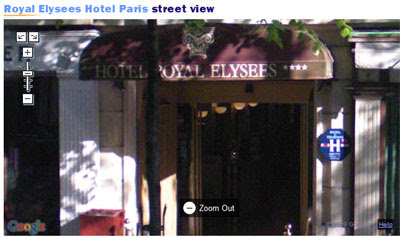 Cheaperthanhotels also uses Google Street View, where available, so it is possible to get a view of the outside of the hotel and get an idea of the locale. ARSights is a new tool that will allow users to visualize Google Earth 3D models using augmented reality. The site uses the Google Earth Browser plug-in to allow users to search for and download Google Earth 3D models. I really like the idea of using Google Maps to help citizens report local problems to local government. In the UK FixMyStreet.com allows anyone to report, view, or discuss local problems, for example graffiti, fly tipping, broken paving slabs, or street lighting. FixMyStreet.com reports all the problems submitted to the relevant local council. For some reason the idea of reporting potholes via a Google Maps interface seems to be very popular. It is a great idea but I'm not sure why these sites restrict themselves only to potholes. The Detroit Free Press has created this Google Map of potholes in the city. Readers can add potholes to the map by competing a short form. All the potholes are listed in a table beneath the map. Clicking on the 'Map It' link will centre the map on that pothole. Better Pune have a mission to help improve the condition of roads in Pune, India. They believe that the the quality of roads in the city is pretty poor and reflects a failure of the municipal and political institutions in Pune. Better Pune uses Google Maps to allow local citizens to report on the location of poor road conditions. All the reported problems are then shown on one large Google Map. It is possible to select the type of road hazard you wish to view by selecting from 'potholes', 'drain cleaning', 'water logging' and 'others'. Clicking on an individual complaint reveals the date the complaint was filed and its current status. This UK based website allows anyone to report a road hazard by entering the location on a Google Map. The site also has a Google Map showing the location of all the reported hazards on UK roads. When you click on a tagged hazard you can retrieve information about the progress of the hazard, for example whether the council has actually fixed the problem or not. Tele Atlas LBS Innovators Series has revealed Nulaz and Rummble as winners of the “LBS-Out the Box” Contest. Nulaz and Rummble will each be awarded €20,000 in cash and a license to use Tele Atlas map data valued at €25,000. Rummble is a mobile phone, location based, social search and discovery tool that uses Google Maps to help users share favourite places. 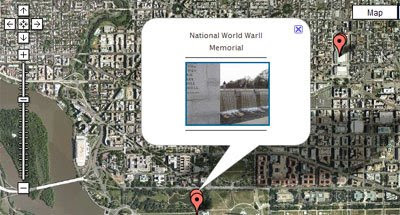 Using Rummble members can add recommended content for a location directly onto a Google Map. Nulaz is an internet and mobile phone application that allows users to see where their friends are, share locations, and view local information, such as a cool party or the newest movie. 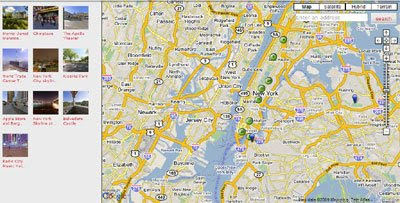 In essence the site combines location-based information with social networking tools. Central to Nulaz is Google Maps. Using the map it is possible to find and chat with other Nulaz members near-by or find places of interest submitted by other users. Points of interest added by Nuaz users are shown on the map with blue 'i' map markers. Other users are shown by green icons. Google Maps Mashup Award Winners!